As I approached the shady park in the Ljubljana city center, a matte pink, vibrantly tinted and thoroughly naked derriere gave me a … colorful welcome. And although it’s crazy, I breathed a sigh of happiness. I love theatre, completely and with the whole of my heart. I spent a decade learning and performing interactive improvisation, so this outdoor street theatre delighted me completely (friends from way back remember the days i trotted around the Renaissance Festival in 16th-century costumes). The situation at hand, however, was tricky because fast approaching me was a member of the solid pink tribe of street performers, and she appeared intent on making me turn pink, too. I am so normally game, but I had just washed all of these clothes, and that’s kind of a big deal when you’re backpacking for a year and washers are both expensive and sometimes hard to find. So I did the only thing I could: yelped in distress and ran in the other direction so that I could watch the actors from a safer distance. It was the first day the annual Ana Desetnica Street Theatre Festival in Ljubljana, Slovenia, and I had extended my time here (and sadly cut it from the Czech Republic) for the express purpose of taking part in this festival. In fact, I planned my entire trip around taking part in the Edinburgh Fringe Festival, and this felt like a lovely warm up event. Art is subjective, right? Well, never more so than when you don’t speak a common language and can’t actually ask for an explanation. The pink people were strange and I left never quite understanding their message, but that’s half of the fun. Every year since 1998, street theatre performers from all over the world descend on Ljubljana in full force. Every single corner, sidewalk, park, and free space becomes an opportunity for actors to create some impromptu experiences for tourists and locals alike. Organized by a local theatre in town, this even grew larger than anyone could have imagined. In addition to honoring and supporting street theatre — a smaller genre than many types of performances — the summer festival welcomes shows and dances to festival stages throughout the city’s parks and public spaces. It’s an inclusive environment and one that welcomes a lot of experimentation and fun on the part of the acting groups sharing their creativity and community. And when I say it’s everywhere, the Ana Desetnica Street Theatre Festival is truly impossible to miss if you visit while it’s in session. While my cousin and I shopped at H&M (in desperate need to replace a few of our meager clothing options) two black-and-white clad performers caught my attention through the glass door with a brief but fun performance of robotic dancing to groovy electronic music pumping from their CD player. 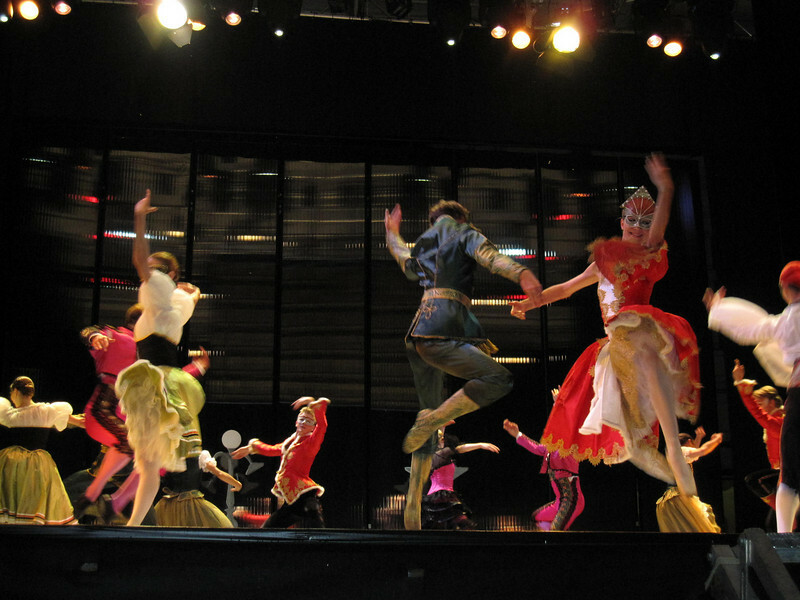 Bar none, the acrobats performing in Station Kansky were the most spectacular event with an impressive wow-factor. Their huge tent sat in what is usually an open grassy area, and it provided the acrobats with room to climb, swing, hang, juggle, jump, and dance from every pole, rope, and possible surface. It was such fun and they had fantastic energy. If improv is about delivering every performance at a ten on the effort scale, they absolutely succeeded. 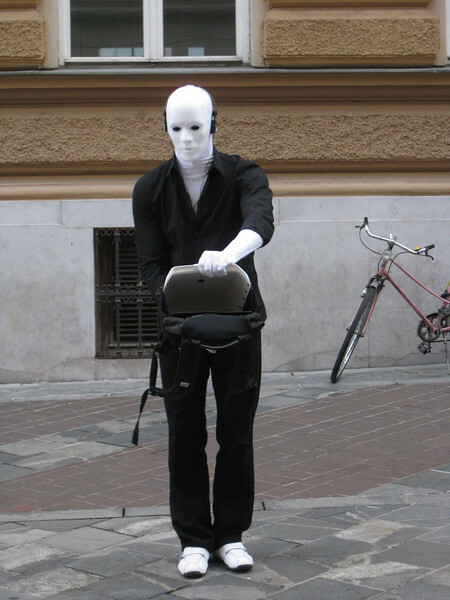 Street theatre is an odd genre, it’s fun and interactive and also very hard to maintain the attention of a passerby. While there was something to love in every performance, it’s a mixed bag of acts and you’ll need to spend several days visiting shows to find the gems that best fit your sense of art and style. And although a few shows suffer from a strong language barrier for English-speaking tourists, a good number rely on beautiful dance and nonverbal communication. The city of Ljubljana comes alive with creative fun. 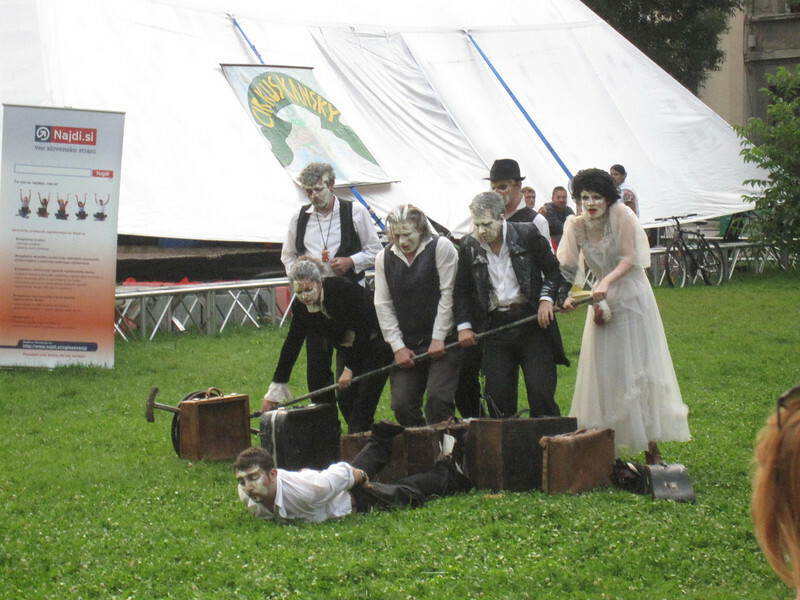 Usually coinciding with the street theatre festival are a number of summer programs hosted by the city. Weekly shows, ballets, plays, concerts, and more. One of those shows was Swan Lake in the Park, which was so pretty and such a lovely way to spend a breezy summer evening. These shows take place on a massive stage in Ljubljana’s main square. The only possible bummer is the weather: it rained half-way through the second act. And while most of the crowd was willing to sit through the rain for the chance to finish the show, the wet stage was too dangerous for the ballerinas. It was such a treat to happen upon this summer street theatre festival. The organization shares very little information in English (2017 update: travelers can now find full show details and English brochures on the official Facebook page), so it was just luck and chance that had me noticing the festival was just a week after I planned to leave Ljubljana. Since my yearlong trip is still flexible, even though I am nearing the end, I simply booked another week at my hostel and settled into the charming city for a chance to immerse in the world of acting that I left behind this time last year when I packed my bags in Los Angeles and booked a one-way ticket to explore. On days like today, I am so glad I faced my initial fears and made this trip happen. When: Summer is a vibrant time to visit Ljubljana and it’s when you’ll have the best opportunity to enjoy the many outdoor festivals, shows, and events. Arts Desetnica usually takes place at the beginning of the summer; use their Facebook page for details on dates and events. For summer shows, use the city’s tourism site to view a calendar of events you’d like to attend while visiting. How: Once you’re in town, visit the tourist information center for brochures on all of the events and activities happening that week. Reading: Use the Rick Steves Croatia & Slovenia guide to plan your visit (although I usually love Lonely Planets, this guide has more local festival knowledge and better transport details, too). For cultural reading (which you should always do! ), read the beautiful memoir Forbidden Bread or find a copy of The Golden Bird: Folk Tales from Slovenia (perhaps use your local library to borrow a copy). 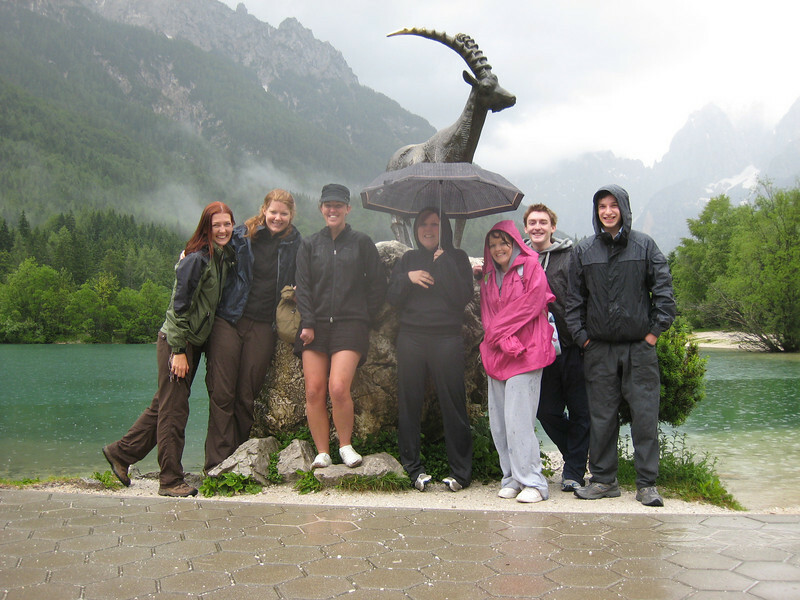 Our tour guide boldly announced that if each member of the tour group rubbed the golden goat, that the rain clouds and dreary weather would dissipate. That was the only impetus I needed to scramble onto the statue and rub it with all the vigor of a Lady Macbeth removing the spot. I desperately wanted warmer weather since we would hike, raft, and generally be outdoors for the entire day. My cousin and I booked an organized tour instead of organizing it ourselves because it had been raining for a week straight. 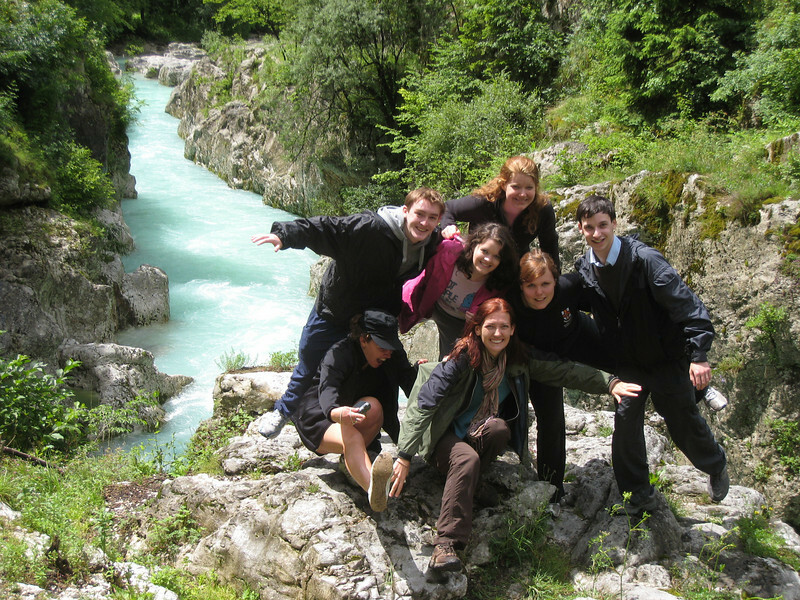 We had wanted to a chance to immerse and enjoy Slovenia’s nature in the north, but we would need help if we hoped to see even half of the things. The Emerald River Adventure day tour was pricey (like, way out of my budget), very long (a whopping 12-hours door-to-door), but the company is top-rated and other backpackers raved about it when we crossed paths. And how could I miss the opportunity to hike the highest peaks in the country and raft one of the most stunning rivers I’ve yet seen? I couldn’t. I paid up, piled on the layers, donned my raincoat, and ran out the hostel door into the waiting van that whisked us off to our first stop: the Golden Goat. 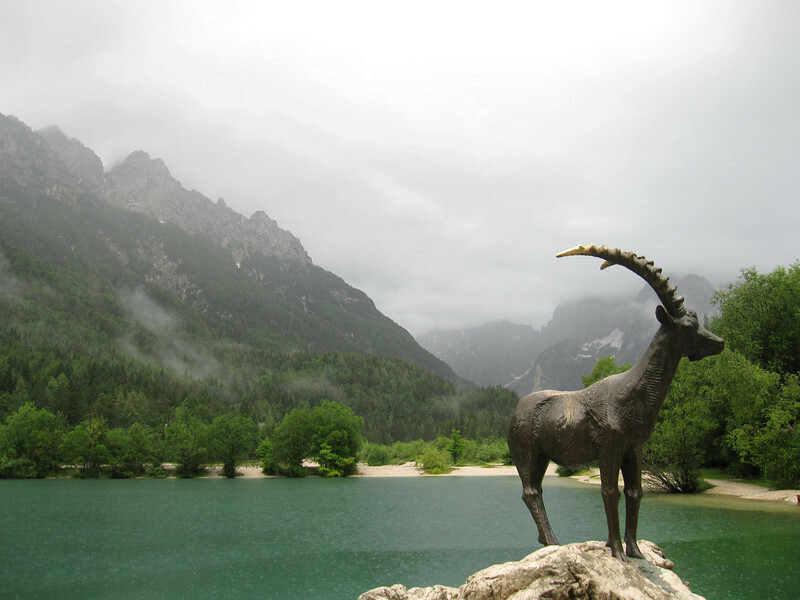 The Golden Goat protects the Triglav National Park and is an iconic spot for any tourists and locals alike. From this vantage point, there is allegedly views of a spectacular snow-peaked mountain rising from behind the goat. But I wouldn’t know. The entire day started as oddly reminiscent of my sad hike through the Himalayas — the drizzling weather refused to clear as we made our way into the mountains. 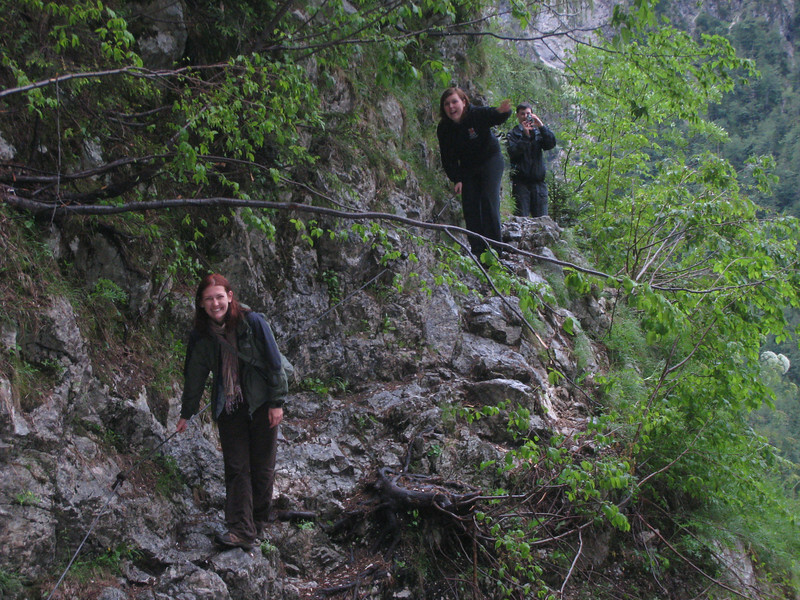 The drive into Triglav National Park is terrifying; nearly a hundred numbered, sharp hairpin turns. 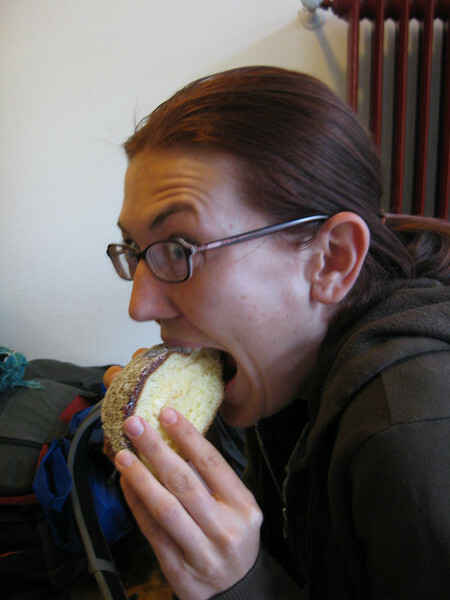 I’ve now lost my lunch in a dozen countries around the world, so I was hoping not to add Slovenia to the list. I traded places with the traveler in the front passenger seat after the first few turns and managed to keep my breakfast down. 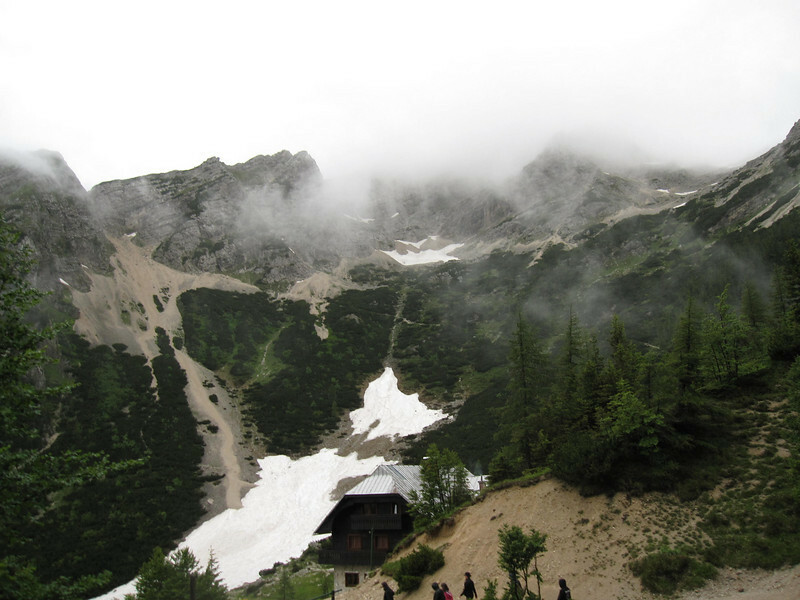 A numbing, cold rain misted over us as we slogged up the mountain path to more sad vistas. This wasn’t my first rodeo — I hiked for days and days in Nepal with nary a mountainscape in view, so I knew how to make the best of the day. I realigned my expectations and hoped that we would, at the very least, have a run time rafting later that day. 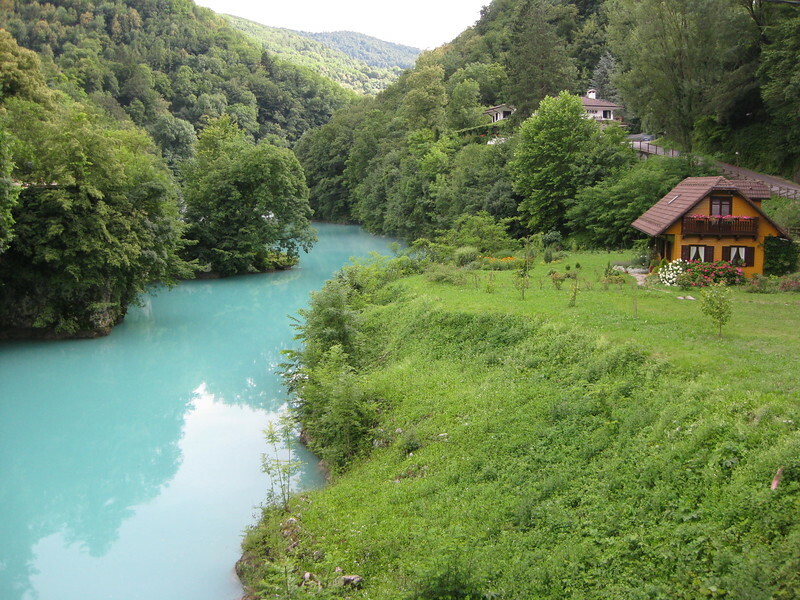 Most of the day trip is structured around the gorgeous Soča River, which originates in Slovenia and is the most unreal color I’ve ever witnessed. The source of the Soča is a small, gushing blue-green hole between some rocks — it’s pretty but not all that spectacular unless you consider the ridiculousness that it takes to actually reach this spot. Our guide led us on one of the most dangerous hike/climbs that I have been on to-date, especially if you consider that it was drizzling during all of this, making the rocks exponentially more dangerous. 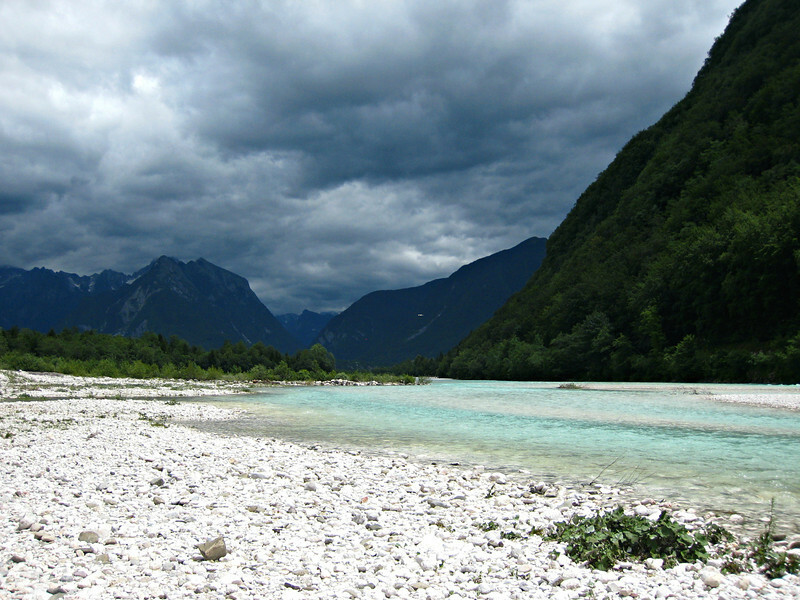 To get to the mouth of the river, I climbed on all four at points, scrambled over rocks, and then flattened myself against the cold, gray, wet rocks with a death grip on the only thing keeping me from falling down into the Soča: a thin steel cable drilled into the rock and marking our lightly-worn path. I asked my guide if anyone dies on this route, and he assured us that no one from the day tour has died, only stupid tourists taking the trip solo — only a mildly reassuring answer, really. During lunch, the golden goat answered our frenzied rubbing because the sun peeped through the clouds and the temperature warmed. It couldn’t have been more perfect timing, because we were about to get wet. Really, really wet. The aqua waters of the Soča River had beckoned all morning and with the sun finally shining, I was psyched for the rafting trip. 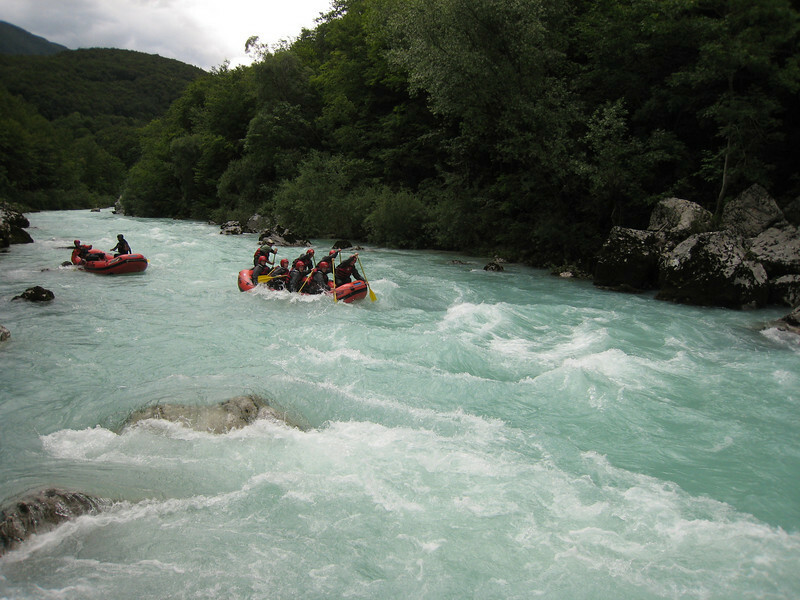 The rapids were only a Grade III, which felt easy-peasy after rafting the Grade IV rapids in Rishikesh, India! My guide was fun and personalable. He introduced himself as Oso, but I misheard him and we all went with the mistake, dubbing him “Awesome” for entire day trip. But, awesome he was not — my rafting guide was a sadist. That’s a joke, mostly. Oso tried to dump our rowdy group in the River at every possible opportunity. The first time, it was hilarious because we all fell for it and laughed it off. His trick was to get us to “high five” the paddles just as we entered a dip in the river. With no one holding on, we all fell from the raft into the chilly water. Then, he purposefully went through the easy rapids so that we (and I was in the front position) would eat as much water as possible. It was all fun though, and meant in good spirit. But, that said, it was cold and my Florida roots when my teeth started to chatter before anyone else in our group. Oso claimed that he dumped us in the river so that we wouldn’t pansy out when it came time to jump off the rocks into the river during one of our breaks And while I still hold fast to the belief that he just truly likes to watch us suffer, there was some truth to his theory. Since I was already wet and cold I was the first person to take a running leap off the tall rocks. Carpe diem and all that jazz, right?! Another first for me was taking the car-train back to Lake Bled, our starting point. We parked on the train and our guide popped open the cooler and handed us each an ice-cold Laško beer. The best part about the beer? Our lucky goat was right there greeting us from the side of the can! The beer went down nicely after a hard day of hiking and rafting and nearly falling from cliff-faces. We all clinked beers and reminisced over a pretty much perfect day trip, even with the lame weather. The tinkling sound of an accordion approached the patio door as I sat on the couch, listening to my host family chatter around me in rapid Slovenian — not a language I understand. The music accordion floated increasingly closer — much too close for coincidence. Within minutes of the lively accordion player stepping through the patio door and jamming out rollicking polka tunes, my host’s father grabbed my hand and pulled me onto the impromptu dance floor for a bit of lively (and awkward) dancing. This was the beginning of my favorite weekend in Slovenia, filled with memorable cultural interactions, a visit to the eerie and wonderful Jama Pekel Caves, and the best donuts to be had in all of Slovenia. 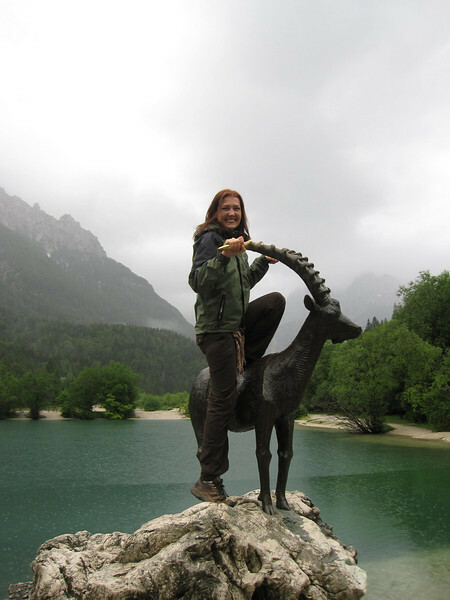 Although I spent weeks in northern and western Slovenia at the more iconic spots — Lake Bled, the Soča River, Ljubljana, etc — eastern Slovenia offers a handful of fun and quirky offbeat experiences. 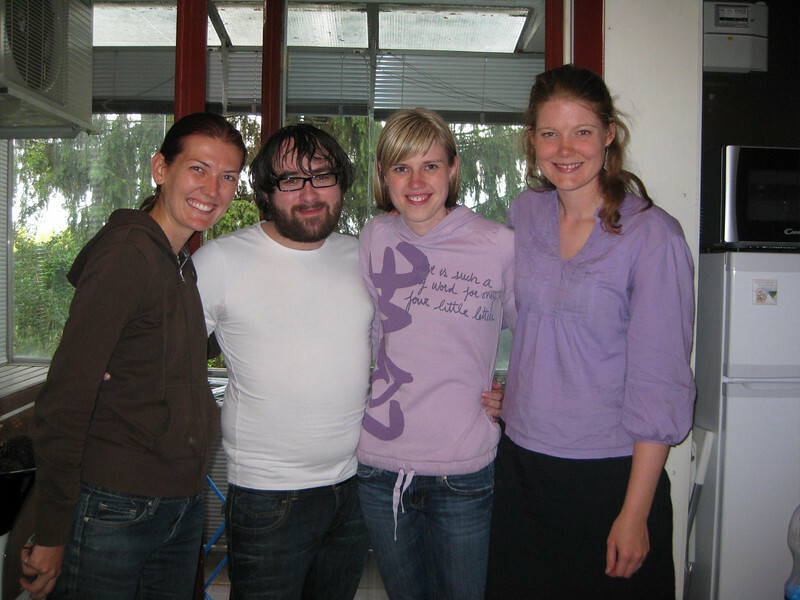 My Couchsurfing hosts, Karmen and Mitja gave me a spectacular welcome to their tiny corner of the world. Shortly after I arrived at their apartment in Ljubljana, Mitja (the “j” is pronounced like a “y”: meet-ya) that his family had invited me to attend his sister’s birthday party on the other side of the country. Well, it’s a pretty tiny country, so that meant we had plenty of time to explore on our cross-country trip. Since it was just a short two hour drive to the east — into the heart of hops country, where the country produces beer and wine — Mitja and Karmen mapped out an itinerary of hikes, ruins, caves, and food that we just had to see before we left Slovenia. Jama Pekel, quite literally translated as Hell Cave, is a fascinating and historic spot dating back more than three million years. The name, however, has little to do with history. During the winter, steam pours from the cave entrance, which is dark and shaped like the head of a devil. 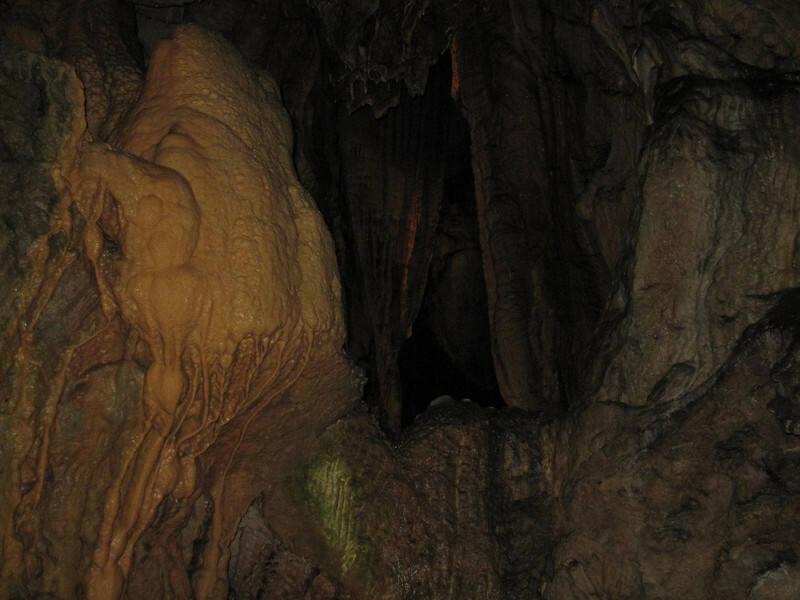 Inside, the cave is creepy and dark — the perfect place to imagine as the entrance to hell. We visited during the summer, so the temperatures were too warm for steam. 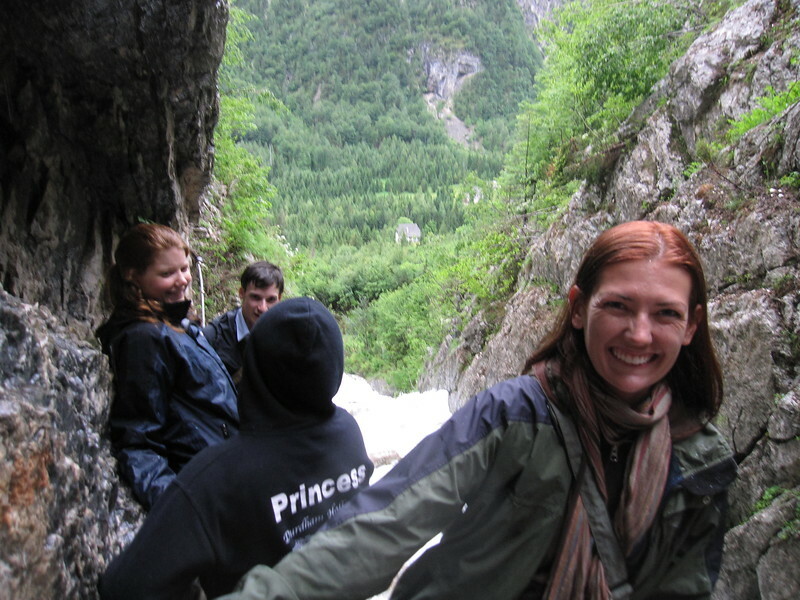 Instead, we entered the caves with a tour guide and proceeded into the depths of hell, excited when she promised that we would witness a large indoor waterfall. One of the strangest freakiest moments happened when our guide led us into a small cavern area, told us to brace ourselves, and then with one push of a button plunged the entire cave into darkness. Impenetrable pitch blackness seeped into my poors and left me disoriented. Honestly, it freaked me out. In this part of the cave, you can truly learn what true darkness feels like as there was not even a safety light on for those brief twenty seconds. Twenty seconds. She kept the flashlight off just long enough that I had begun to panic, but not long enough to have it bloom in full force. After enjoying the view of the underground waterfall, we walked back to the surface, successfully leaving Hell Cave safely, and none to soon in my opinion — caves are fascinating places, but it’s nice to return to the light! Quick Tips to Visit Jama Pekel: Use the official website for times and dates the cave is open. Generally, it’s open every day from 10am to 5pm, with an extra hour on summer evenings. Bring a light sweater as it’s a bit chilly down below and the tour lasts about an hour. 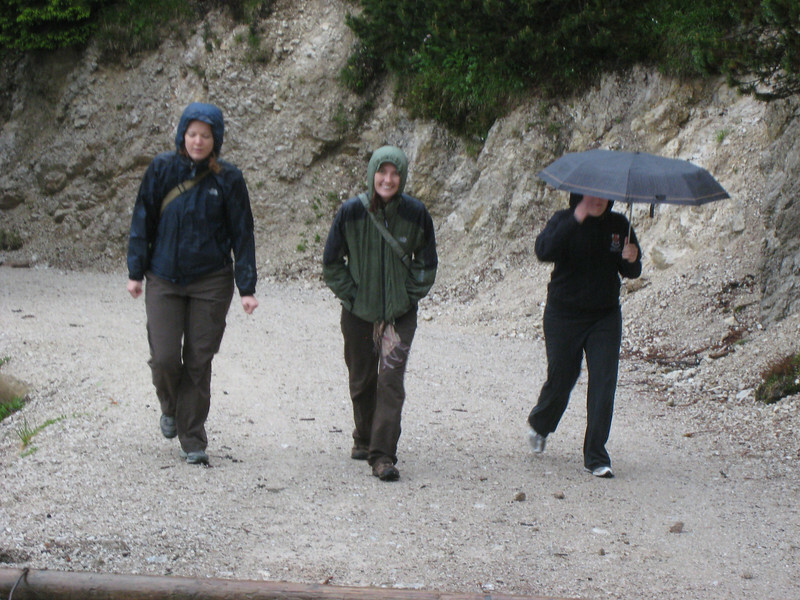 The tour guide will lead you through a series of very well-maintained walkways throughout the caves. In addition to touring the hell caves, we visited Šempeter v Savinjski Dolini, a Roman necropolis that is now a grassy area showcasing the reconstructed sepulchers and marble tombs of wealthy families from the Roman era. The ruins are located just off of the main road between Ljubljana and Maribor, and it’s a quick stop that requires little more than some curiosity. 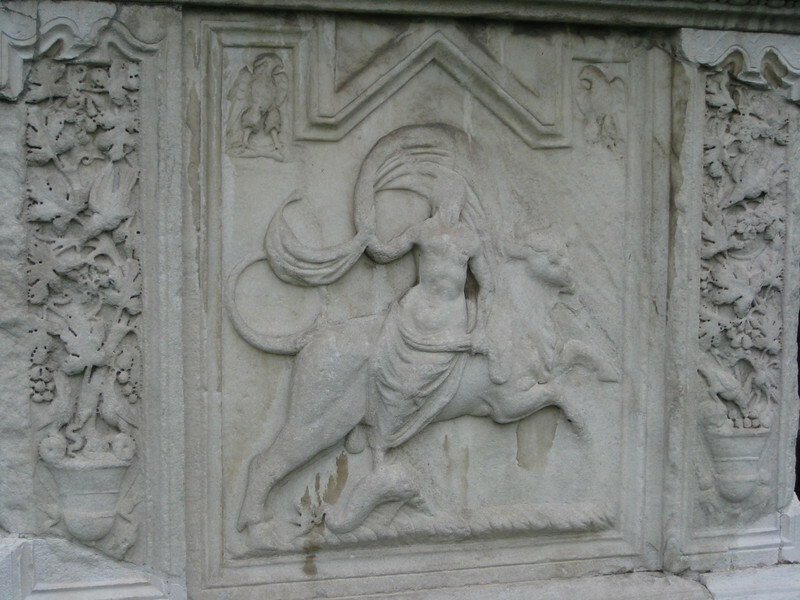 It’s all surprisingly impressive, with reliefs and inscriptions still visible on many parts of the structures. If you’re lucky, one of the people manning the gate will speak English and may take you on a tour of the mausoleums, offering needed context and background. Just in case there is little English-language information, read up on it ahead of time. It’s lovely though. This is a little visited spot — these ruins were only discovered within the past 60 years even though the ruins date back as far as the 1st and 3rd centuries! Flood waters covered the ruins for hundreds of years, which is perhaps why they remained preserved until they were found. 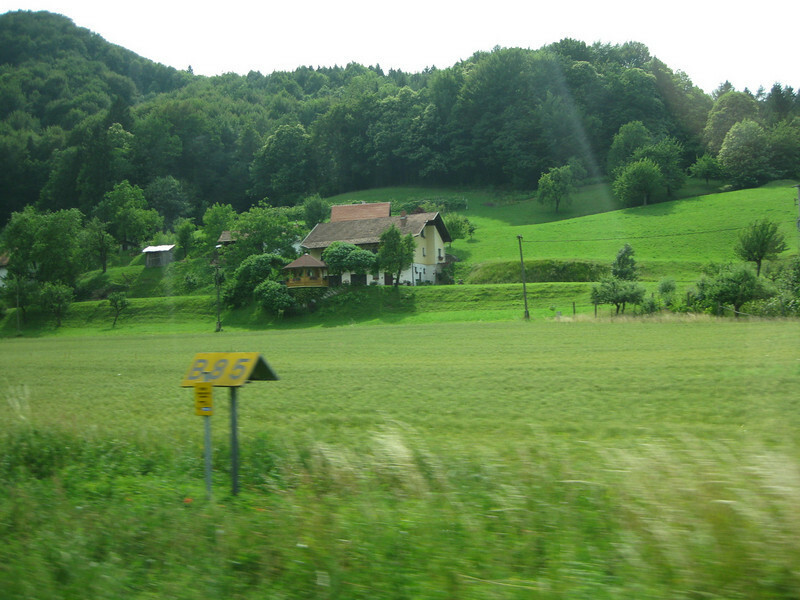 It doesn’t take long to visit, but is a necessary stop on any road-trip toward Maribor. With the number of wineries, icy blue rivers, and gorgeous sites in other areas of Slovenia, the east is an easily skipped part of the country. But one of the reasons that I can only rave about couch surfing is because of the amazing people, and the unique adventure you get when you couchsurf. 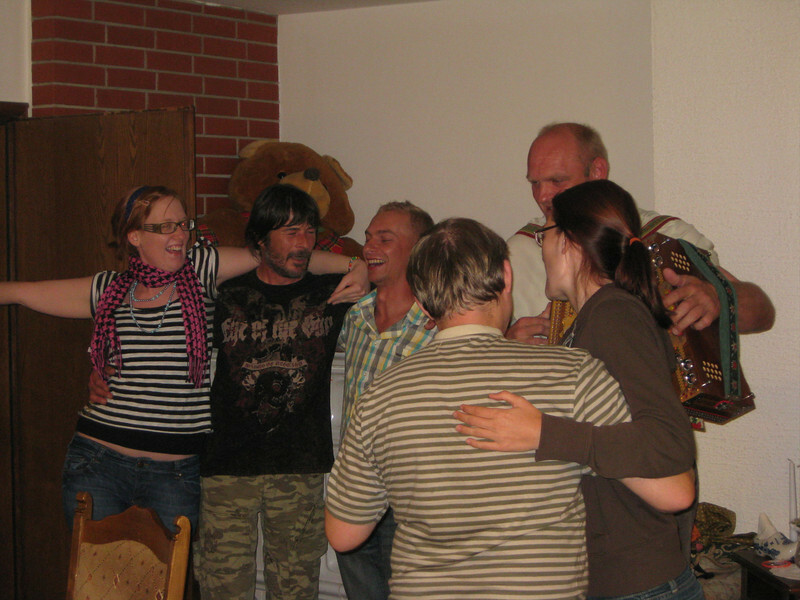 My hosts in Bosnia, Furkan and his roomies, gave me such an authentic taste of Bosnia. And here in Slovenia, Karmen and Mitja blew me away with their love for meeting new people and sharing their home country and culture. After a weekend sharing stories, I learned that Mitja has never sampled root beer or sassafras flavor, so I promised to send him a care package when I return to the states in just a few short months! Bonus: Here is a ridiculous video of me dancing the polka and to accordion music at the birthday party.